Plastic could be considered a necessity to humans. We use it everyday from having out food wrapped in it to construction workers using it as a hardhat to protect their heads. Although it helps us go about our everyday lives, it is having a serious effect on the ocean and marine life. In 1975 it was reported by the National Academy of Sciences estimated around 14 billion pounds of garbage were being dumped into the oceans every year. In 1988 it became illegal for ships to dump plastic into the ocean but this did very little help. Instead that number is now up to an estimated 28-billion pounds of plastic every year. Although the oceans are huge, they are not big enough to disperse all of the plastic that winds up in them. Instead plastics are known to eventually wind up in the same location creating huge garbage patches in the oceans. This occurs because of gyres. Gyres are large systems of circulating ocean currents caused by the coriolis effect. There are 5 major subtropical gyres, each containing its own garbage patch. The most well known of these is the Great Pacific Garbage Patch. In this garbage patch, it is estimated that there is 6 times more plastic than plankton. Plankton is a necessary food source for some marine life. It is also up to 9 feet deep in some portions of the garbage patch. Plastic is floating all over our oceans and it is taking a toll on marine life. Plastic can be mistaken as sources of food for hungry sea creatures. One example of this is that to a sea turtle, a plastic bag looks very similar to and is often mistaken for a jellyfish. Seabirds can also mistake smaller pieces of plastic for fish eggs. By eating the plastic, the animals are not only harming themselves, but they could be transferring it up the food chain as well. This happens when one smaller fish eats the plastic, and then that smaller fish gets eaten by a larger marine animal. The plastic that the smaller fish consumed is now in the larger animals system, and it could potentially get passed further up the food chain. The animals that don’t eat the plastic are not much safer than the ones that do. This is because even if they are not ingesting it, there is a high chance that they will become entangled in it. Plastic packaging is becoming a huge problem for the endangered Hawaiian Monk Seals. Large amounts of plastic debris have been found in areas that they use as nurseries for their pups. 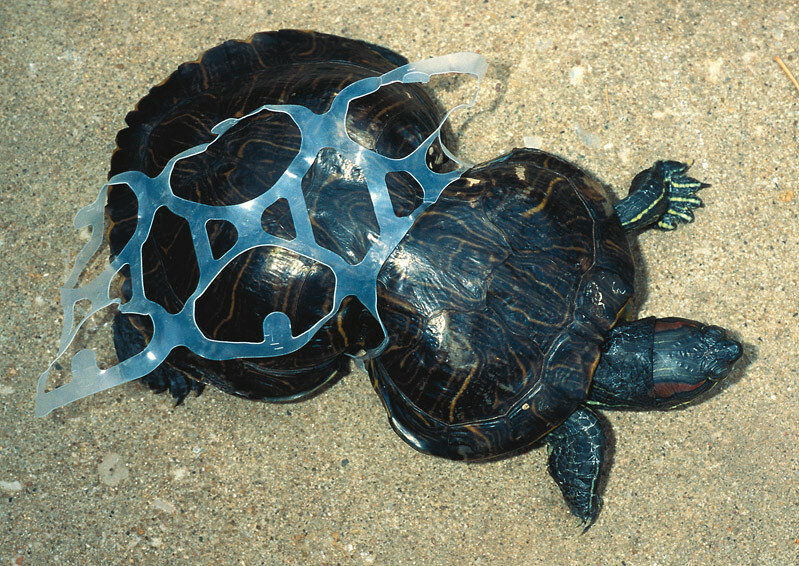 It is also common for sea turtles and other animals to get their heads stuck in the plastic rings that hold soda or beer cans together. Getting trapped in plastic can eventually lead to the animal starving or it can choke the animal to death. Plastic netting is also a huge threat when it comes to marine animals getting trapped. Plastic pollution is having a major impact on the coral reefs. A study has been done by Hall et al. that shows corals will consume micro plastics at the same rate as their food. 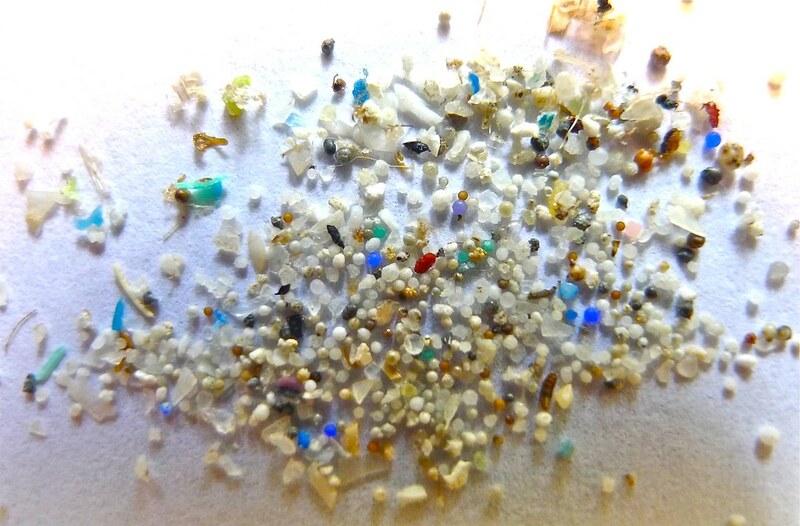 Micro plastics are any piece of plastic under 5mm in size. The corals in this study were found to starve at a very slow rate because the plastic pieces that they were consuming overloaded their stomach and they were not getting the amount of nutrients that they needed. Corals are very non-selective feeders, but they are sensitive to their environment. There have been a number of laws put in place in an attempt to stop the plastic pollution. The Act to Prevent Pollution from Ships (APPS) (PDF) was amended in 1987 by the Marine Plastic Pollution Research and Control Act. It is meant to reduce the amount of improperly disposed plastic that is released into the environment. It also studies the effects that this plastic is having on the environment. The Marine Debris Research, Prevention, and Reduction Act (MDRPRA) (PDF) has established programs within the National Oceanic and Atmospheric Administration (NOAA) and the United States Coast Guard. Its goal is also to reduce the amount of plastic and trash that gets put into the marine environment. The Shore Protection Act (SPA) is another Act that was put into place in order to stop this growing problem. This Act controls the transportation of waste in coastal waters. Wow the video of the garbage patch is shocking. So much plastic is used and wasted everyday. 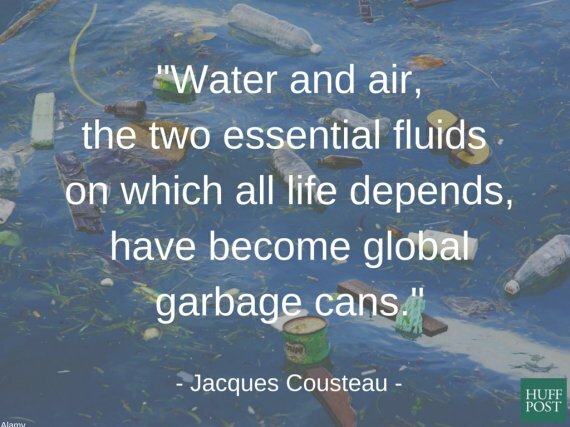 I was just telling myself this the other day when I unwrapped an appliance out of a box and how much extra plastic was used. One question, as you mentioned how when a smaller fish eats plastic then gets eaten by a a larger fish and goes up the food chain, do you know how it could effect humans that are eating the fish with plastic traces? Well written blog post, good job! I think you have a lot of good information and facts, and I really like how you connect all of this at the end with current laws and acts, I think that is an important piece to this blog post, maybe by expanding on the laws and acts that are already in place, you could add in your own opinions on the laws, if they are working or not, or if there is any updated information regarding whether these laws in place are actually working. You could also expand with current laws that are trying to be passed through congress regarding plastic, such as the ‘Microbead Free Waters.’ Overall though, I think this is a very interesting topic, and I am sure one could go on and on about the effects of plastics, good job! just going to leave this picture here! I love this picture! That is so true. Wow, these shoes are so cool! This definitely is a good way to use a lot of the wasted plastic.